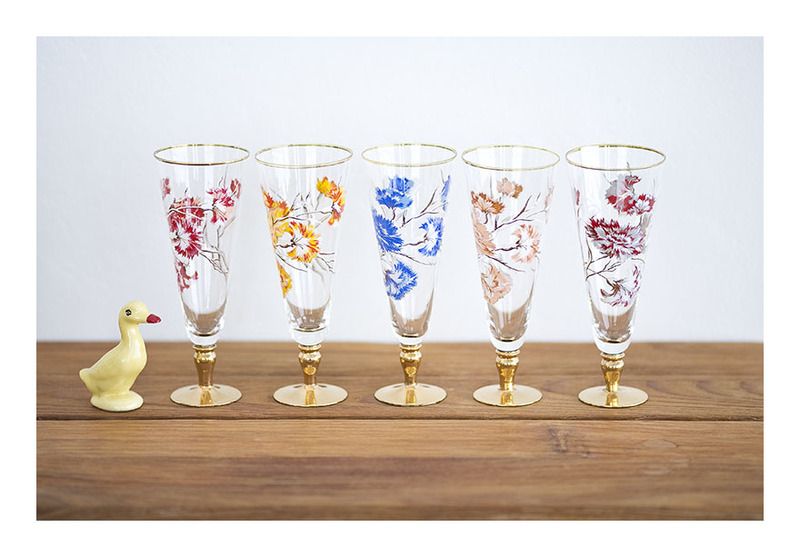 I’m rather fond of these kitsch decorated champagne flutes – the gilt rim and base helping somewhat to offset the rather garish carnations. The glasses were won in a golf tournament by my partner’s brother- and they had pride of place in the family’s display cabinet for many, many years. I don’t think they were ever used to imbibe champagne…they were considered far too precious. They were for display [and admiration] purposes only. The set now needs a new home – I’m imagining a nice mid-century modern drinks cabinet…where they can be taken out from time to time to drink champagne. Or beer. Beer would also be good. I think they’re really pretty and not garish at all. thanks! i agree with you! but – the blue carnation? it is kinda garish!